My wife is Kate's cousin and I have known Kate since she was 8 years old. She used to spend holidays on Isle of Man where I lived. My wife's and Kate's families are quite close. I have known Gerry since 1997 when he was going out with Kate before they married. I haven't seen Kate and Gerry very often, but we always met at family events such as weddings and baptisms. I didn't attend their wedding because my wife, Anne-Marie, was ill and we didn't attend their children's baptisms because we were away on holidays. That said, since the birth of the twins we have met more frequently. In August 2006 they came to visit us at our house one weekend and that was very pleasant. 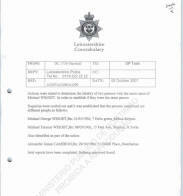 On our side, we visited them in Rothley in November 2006 and they repeated their visit [to us] in February 2007. We work well together as a group and we know each other very well. We were planning a family holiday [together] for June 2007 at Center Park. 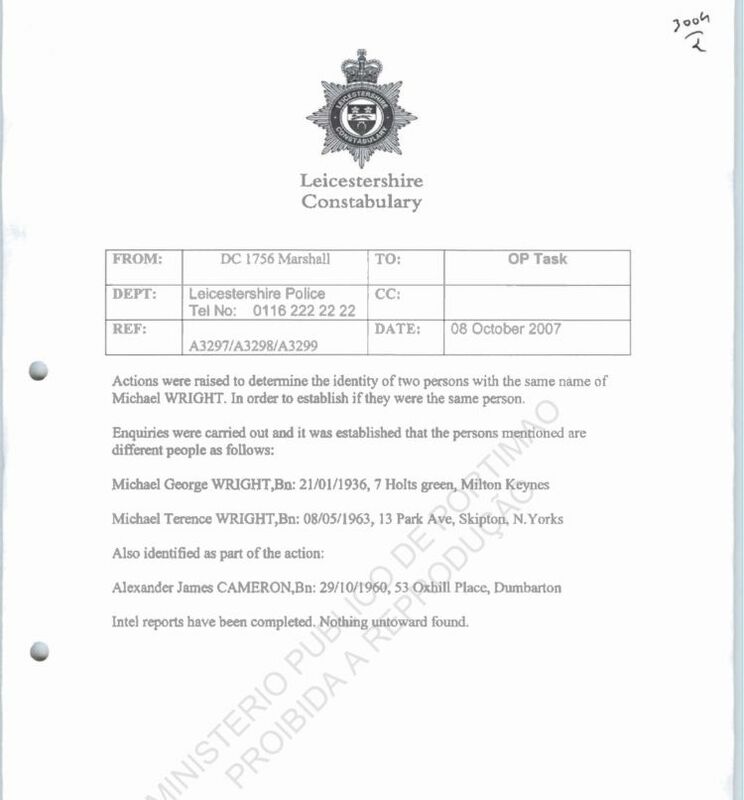 I wasn't in Portugal on 3 May at the time of Madeleine's disappearance. About 23:00 that night I received a very uncomfortable [or compelling] call from my wife's mother who told me about Madeleine's disappearance. Aunt Nora, from Canada, was in Skipton and was about to return to Canada the next morning. I suggested that she go to Liverpool instead. We all thought that Madeleine was going to appear in the following hours, even while I drove Nora back to Liverpool in the early morning of Friday, 4 May. I stayed in Liverpool. I spoke to Kate by phone between 10:00 and 11:00am that morning and she confirmed that she wanted her mother, her father and Nora with her. The family liaison [officer?] arranged the journey of the mother, father and Nora to Portugal that same afternoon. I went with them to Manchester airport. 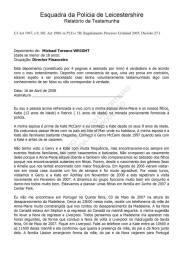 Kate's mother asked me to come to Portugal and I agreed on condition of speaking first with Gerry and Kate. On Saturday, 5 May, I caught a plane from Leeds-Bradford to Faro and caught a taxi from the airport to the Mark Warner complex. Initially I stayed in an apartment in the same complex as Kate and Gerry. Those first days were hectic, always surrounded by the media and the situation appeared very transitory [temporary] with family and friends sleeping wherever they could. In Friday, 11 May, I returned home for a weekend with my family. - Friday, 8 June to Wednesday, 13 June. I travelled with my wife, Anne-Marie. This trip was for us to take care of the twins while Kate and Gerry made a brief trip to Morocco. - Thursday, 12 July to Friday, 13 July. I travelled alone and returned with Kate and the twins for them to attend the baptism of my own children. I had spoken previously with Gerry by phone and knew that he was in UK in meetings and he asked me to help Kate and the twins so that they could be there. Kate, Gerry and twins returned to Portugal on 15 July. - Wednesday, 22 August to Saturday, 1 September. I left with Anne-Marie and our children, K and P, to replace Sandy and Trish Cameron. During this period we spoke with Kate and Gerry about the best time to return to UK. Provisionally the second week in September was decided and I contacted a removals firm in Lagos in my name, and I collected packing boxes and adhesive tape. We then began to pack all the stuff we wanted to keep, such as letters, postcards, etc. - Friday, 7 September to Sunday, 9 September. Gerry called me the night before and told me he was going to be interviewed the next day. I travelled alone and met Sandy Cameron at the airport [presumably Faro] and we caught a taxi to the villa. Kate, Gerry, the twins, Sandy and Trish, and Eileen McC left Portugal on Sunday morning and I left by myself that same afternoon after cleaning the villa. During my initial trips to Portugal I stayed in Mark Warner apartments. In July, August and September I stayed in the villa rented by Kate and Gerry, I recall nothing strange about anything where I stayed. I didn't look for things that were particularly strange or suspicious but I did pay close attention to the Mark Warner apartments to consider potential hiding-places which could have been used by an intruder. 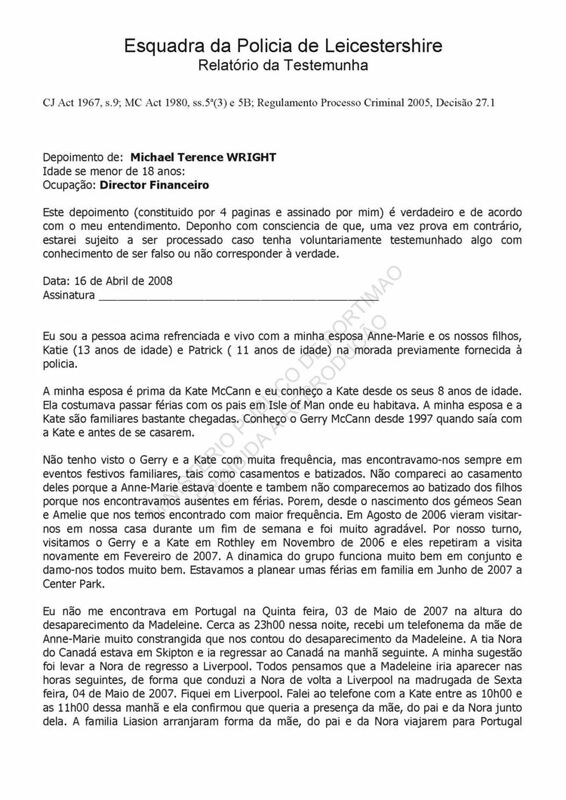 During my first two trips to Portugal, I recall that Kate and Gerry were in a flat spin, [NOTE] but I spent a lot of time with them especially at night at dinner. I frequently helped Sandy with with mundane tasks such as opening the mail. We received many e-mails relating to the campaign and there was much in them to talk about, but our time with Kate and Gerry during the day was very irregular. During my stay at the villa our time was more concentrated. [NOTE: The verb expression 'andar à roda' means to turn something round, or to spin something round, so I think that the word 'viva' [cheers, applause] in the statement should actually be 'vida' [life], i.e. their life was being spun round, almost out of their control, like an aircraft in a flat spin]. With respect to Kate and Gerry's comportment after the disappearance, I witnessed first hand their desperation, how they cried and were distraught, though never during their meetings with officials or at press conferences. It was uncomfortable to see. I also saw them organised and controlled in meetings and in front of the media, and felt proud and impressed at their power of self-control on those occasions. At the time I travelled with Anne-Marie on 8 June, Kate and Gerry had rented a vehicle. It had seven seats, I judged [thought] it to be a Renault Espace. Gerry suggested that I be added to the insured driver's list so that I could drive it while they were in Morocco, but I judged [thought] that to be unnecessary as they would only be gone for a few days. When I was in Portugal on 12 July I was picked up by Kate who was driving the Renault Espace. 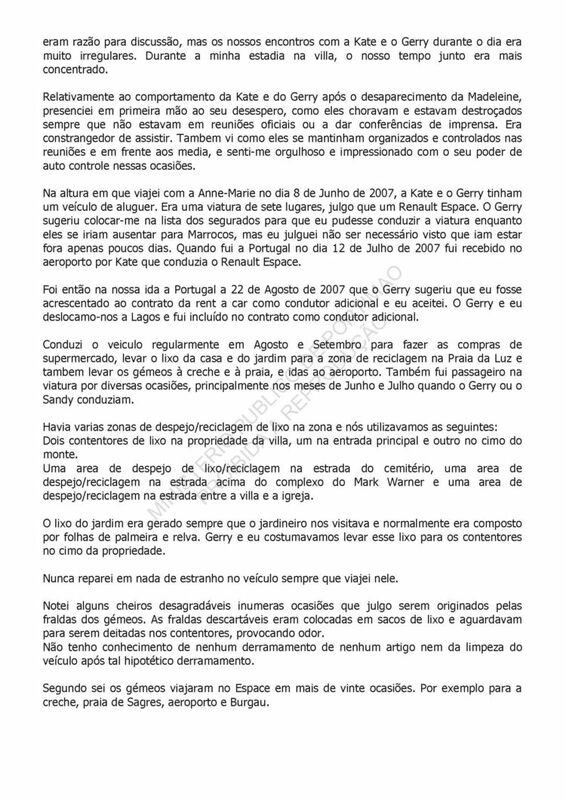 It was on our trip to Portugal on 22 August that Gerry suggested that I was added to the contract as an additional driver and I accepted. Gerry and I went to Lagos and I was included in the contract as additional driver. I drove the car regularly in August and September, doing the shopping at the supermarket, taking the house and garden rubbish to the recycling area in PdL and also taking the twins to creche and to the beach, and trips to the airport. I was also a passenger in the car at various times, mainly in June and July when Gerry and Sandy drove. - one area between the villa and the church. The visiting gardener always generated garden rubbish and this was usually leaves and grass. Gerry and I would usually take this rubbish to the bin at the top of the property. I never observed anything strange in the vehicle at any time that I was in it. I noted some disagreeable smells on a number of occasions which I judged to have come from the twins' nappies. Discarded nappies were collected in rubbish bags and held until thrown into the [rubbish] bins, [thereby] provoking smell. I have no knowledge of anything spilling from any article nor of any cleaning of the car after such a hypothetical spill. I know that the twins travelled in the vehicle more than twenty times. For example, to creche, [to the] beach at Sagres, the airport and Burgau. I am absolutely certain that Kate and Gerry were not capable of hiding Madeleine's body and later transporting it to a dump. 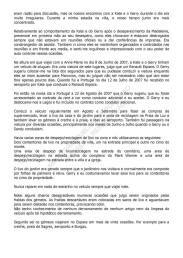 As for additional information I would like to add that on Sunday, 6 May I went to the pizzaria in PdL and bought a large quantity of pizzas. I was attended by a girl from Liverpool. I explained to her my relationship to the McCanns and she told me that her father 'George' had seen a man carrying a child in his arms in the early morning of 4 May in the resort. I asked her if her father had spoken about this to the Portuguese authorities. I don't know if the information was ever investigated. Actions were raised to determine the identity of two persons with the same name of Michael WRIGHT. In order to establish if they were the same person. Intel reports have been completed. Nothing untoward was found.